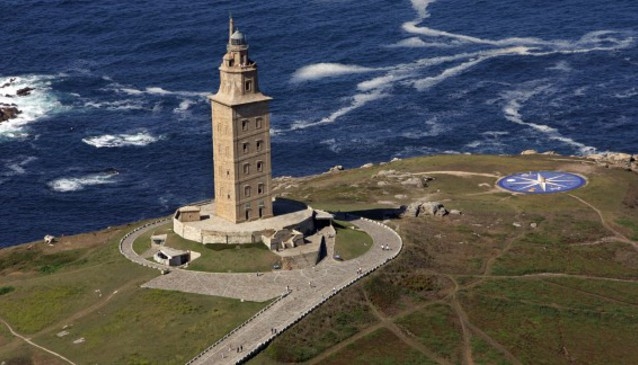 The Tower of Hercules is a UNESCO world heritage site being the only Roman lighthouse in the world which, since its origins up to the present, has been performing its original function: being an aid to navigation for ships crossing the Atlantic Ocean. This peculiarity makes it an outstanding exponent which bears a unique testimony to the numerous lighthouses erected by civilisations of the past by the sea and which have unfortunately been lost to time, while the Tower of Hercules remains faithful to its mission of guiding the seamen who come face to face with the immensity of the ocean on a daily basis. The lighthouse was most likely built in the second half of the 1st century or the early years of the 2nd century A.D. by the Romans at finis terrae (Latin for 'end of the world') of the world known, namely, north-western Hispania, at the mouth of the great Gulf of Artabro, which encompasses the rias of El Burgo, Ares and Ferrol (La Coruña) to guide the ships sailing along the most western coast of the Empire. The location chosen to build it was a rocky hillock, known as Punta Eiras, some 57 metres high, which is between Punta Herminia and Punta del Orzán, thus dominating the northern end of the peninsula on which the city of La Coruña itself rises. October - March: Monday to Sunday from 10:00 to 17:45. April, May, June and September: Monday to Sunday from 10:00 to 18:45. July and August: Monday, Tuesday, Wednesday, Thursday and Sunday from 10:00 to 20:45. Friday and Saturday from 10:00 to 23:45. Children under the age of 14, Youth Card holders and people over the age of 65. Groups over 20 people, as far as arranged in advance. On the days and in the cases arranged by the Junta de Gobierno (government board of the A Coruña Provincial Council). Educational groups of the municipality of A Coruña, as far as arranged in advance. Tickets for teachers in charge of certain groups or tourist guides performing their task, after previous presentation of identification. People with physically or psychically disabled, (accreditation must be shown). Visits of members of the Friends of the Archaeological Museum Association and of the International Council of Museums. On the International Day of Museums.